We all know just how hard it is to get a job when you have a documented disability. What if there was a way to get bumped to the top of the hiring list just because you have a disability? This may seem out of the ordinary, but it does exist. A program called Schedule A allows people with documented disabilities to more easily apply for jobs with the federal government. The best part is they can apply just about anywhere they want. There are many different jobs available that range from professional writing to working as a dispatcher with the Forest Service. Before you even get started, there are some things to know. The most important is that you must have a documented disability in order to apply. For most government internships, you need to be enrolled at an accredited college or university and pursuing a degree plan. For government jobs, the education requirements will vary, but you must have obtained at least a bachelor’s degree from an accredited university. The first thing you need to do is go to www.usajobs.gov and create an account. This allows you to apply for job openings and check the status of submitted applications. Once you have an account set up, start searching for jobs by keywords, as well as city or state. It helps to have a geographic area in mind when searching, but the possibilities are endless. Once you find a job that interests you, apply using the application provided by the government agency. This is important, as each agency is different. Make sure all the information is correct and you have all necessary paperwork. Having the required paperwork is important here. 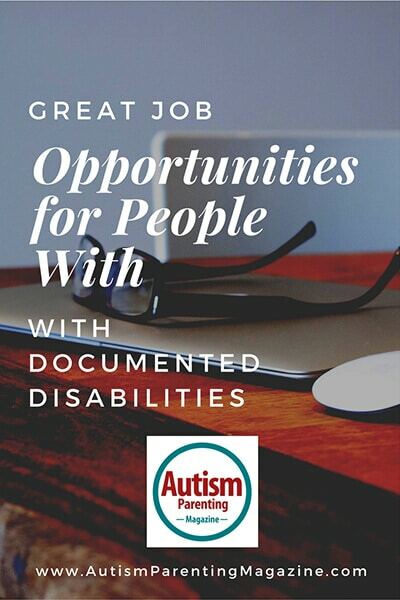 Resumes, college transcripts, cover letters, and disability documentation are all needed. Setting up a resume and cover letter is pretty easy. Most online templates are very professional and require very little time to put together. College transcripts, even if you are still working toward a degree, can be ordered from your current place of enrollment for a small fee. Make sure your medical doctor documents your diagnosis and it’s up to date. It’s also important to have a professional email set up for this. I recommend a work or school email, but a personal one is fine, too. For personal email addresses, use a combination of your first and last name. This makes it professional, but also easy to remember. Talk to your therapist, teacher, mentor, or other clinician and see if he/she can help. Most of the time, he/she can provide a few good leads and get you on the right track. Most importantly, make sure you apply by the deadline because you don’t want to miss a potential opportunity. If you don’t get the job, don’t be discouraged. Most of the time, there will be other opportunities available. It’s also important to follow up with the agency in a timely manner if you don’t hear back from it. Following up can be tricky, as there is a difference between checking in and being a nuisance. I recommend following up every two weeks just to let the agency know you are still interested. So, you get considered for an interview, now what are the next steps? First, be flexible with the agency. Find a day and time that works for both of you. This is important, since you don’t want to be a no-show for the interview. Next, make sure you have reliable transportation to and from the interview. If using public transportation, plan your trip ahead of time, and do a trial run so you know how long it takes to get there. For people in Texas living in Harris County, METRO Transit Authority of Harris County’s website, www.ridemetro.org, allows you to plan a trip anywhere in the system for over 9,000 destinations. Once you plan your trip, it will even show you what routes to take and if there are any delays that could impact your travel. For interview preparation, make sure you research the company and the position thoroughly and prepare questions for the person conducting the interview. The day of the interview is here. Make sure you have cleaned up and look professional. For men, while you don’t necessarily need a suit jacket, some things are a must: a button-down shirt, dress shoes, slacks, a tie, and a little bit of cologne. For women, a dress shirt, blouse, dress sandals, and a little bit of perfume are necessary. Trust me when I say this. It really does make a lasting first impression. Now that you’ve arrived at the agency, the first thing to do is let the front desk know who you are and why you are there. Once you are checked in, have a seat and relax. When the time for your interview arrives, make sure you introduce yourself to the person who is conducting the interview. Don’t be afraid. Relax. Think about why you want to be considered for the position. After the person conducting the interview has finished telling you about the position and asking questions, feel free to ask when a decision will be made. This will give you a rough idea of how long you have to wait before hearing back. After the interview, thank the person for their time. Once you get to your residence, make sure you send a thank you email or thank you note. This shows that you are indeed interested in the position and grateful for the opportunity. If the time comes, and you have not heard back, call or email the person who conducted the interview and ask if a decision has been made. This not only shows initiative, but can also remind the agency to get back with you very soon. Schedule A is a great way to apply for government jobs if you are an adult with a developmental disability. It allows you to get put at the top of the hiring list and can also open up many opportunities for a future career or internship. If you do get the job, it’s OK to be excited. Philip Feldwisch is a December 2014 graduate of Valparaiso University in Indiana with a degree in journalism. He currently attends University of Houston-Downtown and is pursuing a degree in professional writing. He hopes to graduate in December and get a job as a journalist or writer. When he was diagnosed with autism, he finally knew why people picked on him and saw him as an outcast. He is an anti-bullying advocate and wants victims to know they are not alone. philip you were never diagnosed with autism. you diagnosed yourself. you also don’t have a bad ankle.